I’ve been a big fan of author Jojo Moyes ever since stumbling across Me Before You years ago. This was before the movie and before a lot of the huge hype. Me Before You first introduces the loveable Louisa Clark, wearer of quirky vintage clothes and bumblebee yellow and black striped stockings. In this first book she becomes a carer to Will Traynor, a complicated man not coping very well with life as a quadriplegic and they both change each other’s lives. If you haven’t read this first book, definitely give it a go. I don’t want to give anything away if you haven’t read it. I loved Me Before You, even though it smashed my heart to pieces, and was quite happy for it to be a stand-alone book. 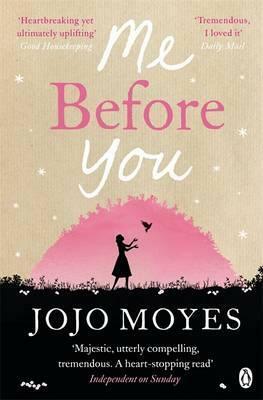 But then Jojo Moyes released a sequel called After You. Although I devoured this book it didn’t have quite the same feel as book one. Louisa was far from the happy, positive young woman and with a major character missing in this book, it was a bit of an adjustment. But I liked it well enough in the end. Me Before You by Jojo Moyes is a very misleading book. The title suggests a light, fluffy romance, which is backed up by a pink cover that gives nothing away. Nor does the book’s blurb. Lou Clark is a twenty-something woman who just lost her job at The Buttered Bun tea shop in a sleepy English town she has lived in all her life. She is about to meet Will Traynor – a man whose motorcycle accident took away his desire to live. Cue a mismatched pair ala Bridget Jones and Mark Darcy and wait for the sparks to fly. Well, that’s what the book’s packaging seemed to indicate. But what I got instead was very different. Yes, there are still the elements of two very different people meeting and not getting on. There is growing understanding over time. But what you don’t know until you are reading this book is that the character Will Traynor is a quadriplegic. And though you hope for some miracle to occur and for him to get up and walk, this book is far more realistic than that. Lou Clark gets a job as his carer although she has no qualifications. All she can do for him is make cups of tea and give his flat a clean, whilst trying to stay out of the way of his bad temper. Before becoming a quadriplegic, Will was a lawyer and an adrenalin junkie with a zest for jumping out of planes and climbing mountains. His accident made him lose everything, including his model girlfriend. He sees nothing good about his life. Lou finds out that she got the job because Will has scared away all his other carers. And his mother wants him to be watched at all times because he has previously attempted suicide. Then Lou learns by accident that Will has gotten his parents to agree that in six months time they will take him to Switzerland where there is assisted suicide. Though sworn to secrecy by Will’s mother, Lou makes it her personal mission to try to make Will change his mind. So as you can see, this is not the formula for a typical chick lit book and the publishers of this book may have done it a disservice trying to market it that way. I read this book in a day. I just couldn’t put it down. In the course of reading it, I learnt so much about what people who are quadriplegic go through. They have countless medical problems. Not to mention the mental anguish of going from able-bodied to life in a wheelchair. Even the problems they have going places when in a wheelchair and how they are treated by family, friends and wider society. But this story is not all about Lou trying to change Will. It’s also about Will trying to encourage a young woman who has no goals, has never gone outside her town, and is with a fitness mad boyfriend who doesn’t get her, to branch out in life – and live.